SIM808 GPS/GPRS/GSM arduino shield is an integrated quad-band GSM/GPRS and GPS navigation technology Arduino expansion shields. A credit card size only, according to the standard Arduino pin packaging, compatible with Arduino UNO, arduino Leonardo, arduino Mega and other arduino mainboard. Compared to the previous generation SIM908, SIM808 made some improvement on the performance and stability. In addition to the normal SMS and phone functions, the shield also supports MMS, DTMF, FTP and other functions. You can achieve the data acquisition, wireless data transceiver, IoT application and GPS orientating. The should integrates onboard microphone and headphone jack, saving your cost and making your project easily. 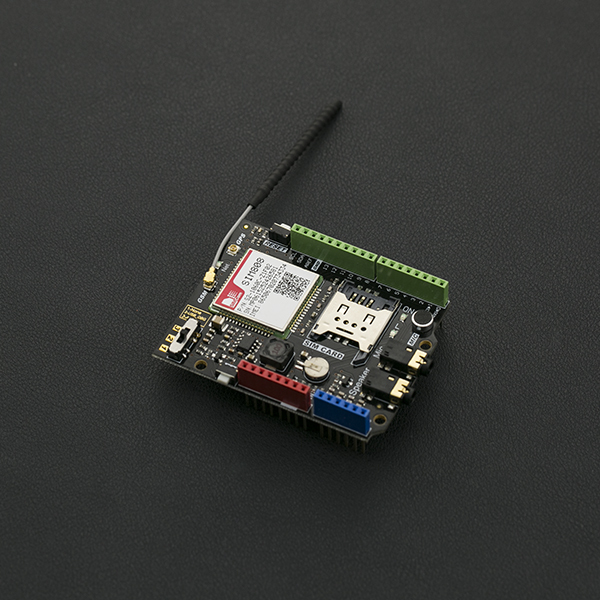 it can also directly connect to the GSM and GPS antenna by an external antenna connector. 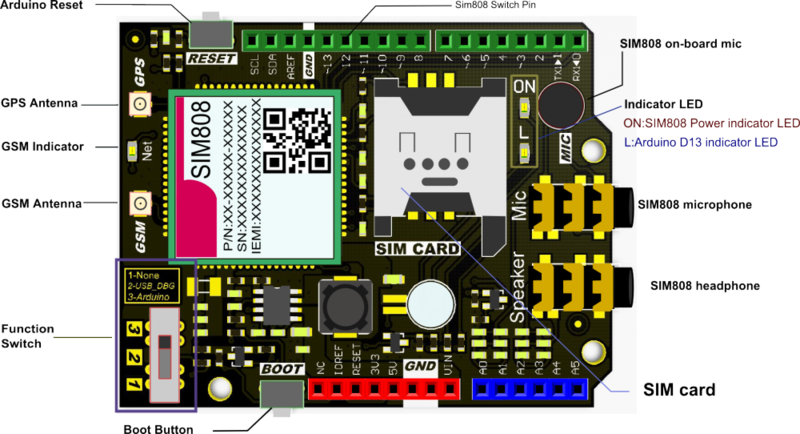 SIM808 GPS/GPRS/GSM Arduino Shield V1.0 uses the latest version of Simcom SIM808 module, compared with the early SIM808 module available in the market, the new module has better stability. But GPS part of AT commands are not compatible with the old version of the SIM808 module, please refer to the bottom of the "more" in the AT commands. Occupied pins: D0, D1, D12, the digital pin "D12" is connected to SIM808 module power GPIO. It can be used as SIM808 module on / off control. SIM808 onboard MIC and 3.5mm SIM808 microphone are using the same MIC channel, when you plugin your microphone, the on-board MIC will be automatically disconnected. Boot switch button --SIM808 module switch, short-press 1s to start SIM808 , long-press 3s turn it off. LED "ON" - SIM808 power indicator, only when you connect an external power, the module can work properly. None-- Vacant SIM808 serial pin to download the sketch, please dial to here. USB_DBG-- When the expansion board plugged on the Arduino, dial to here to make SIM808 communicate with PC to make a debug (AT debugging). Arduino-- When the expansion board plugged on the Arduino, dial to here to make SIM808 communicate with Arduino. In this SIM808 Arduino Shields tutorial we will cover how to use Arduino to drive a SIM808 GPS/GPRS/GSM Shield. 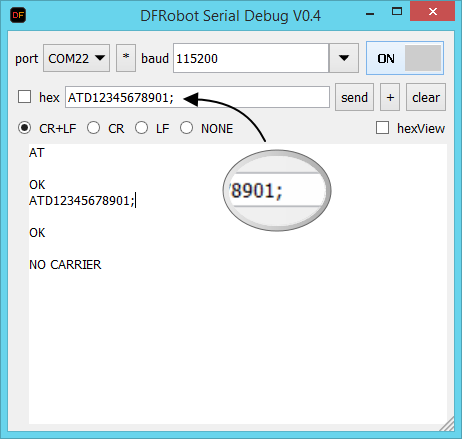 DFRobot_SIM808 is a open-source Arduino library with intuitive functions. With an array of functions packaged into a single library, you can focus on your project and not waste time studying complex AT commands. 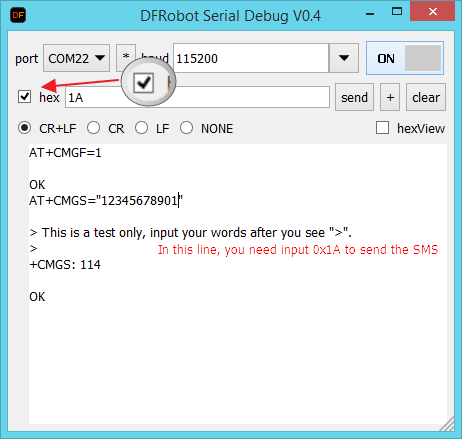 This example tests DFRobot_SIM808 SIM808 GPS/GPRS/GSM Shield's callUp function. 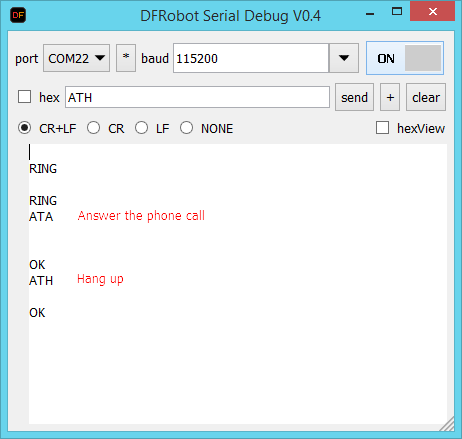 This example tests the DFRobot_SIM808 GPS/GPRS/GSM Shield's call answering and SMS reading function. 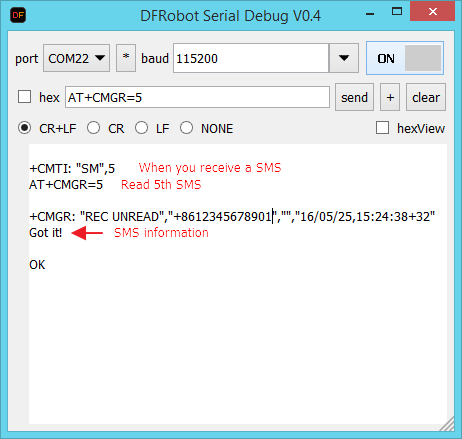 This example tests the DFRobot_SIM808 GPS/GPRS/GSM Shield's ability to read SMS messages. //make sure that the baud rate of SIM900 is 9600! This example tests SIM808 GPS/GPRS/GSM Shield's ability to read GPS data. In this section, we will send AT commands through the serial port to debug SIM808 expansion shield. Please refer to SIM808 AT command set for more function. Plug your SIM card on the SIM808 expansion shield and plug the expansion shield on Arduino UNO, meanwhile don't forget to connect an external power source. Dial the function switch to None, download a sample code Blink to make sure the serial port is not occupied. Press the Boot power button and wait for the SIM card registering a network properly, the Net indicator led flashes slowly (3s once). Slide the function switch to USB_DBG, then we can communicate directly with SIM808 chip through the serial port assistant. 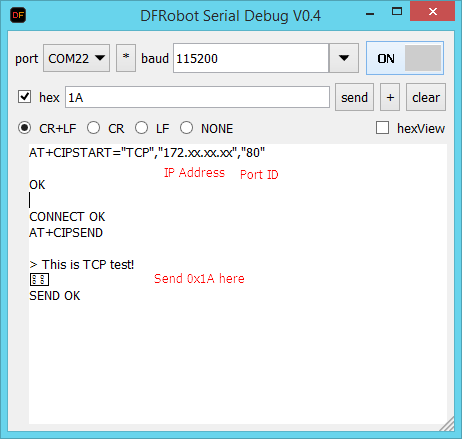 Send AT in the serial port assistant, if it returns OK, it means that serial communication has been established. Follow the Figure, enter AT commands, you should get the same content. Note: The GPS antenna must be placed outside before it can obtain a stable GPS location data output. If the GPS antenna has been placed outside, you should get the right data soon. When you want to pause GPS data output, you can sent **AT+CGNSTST=0** command to pause GPS data output. When you want to turn off GPS function, you can send AT + CGNSPWR = 0 command to turn off the GPS power. Send AT + CPOWD = 1 to shut down the SIM808 chip. More exciting instruction, please refer to AT command on the page of the end. These two test code are very simple, and easy to be understood. Only need to enter the corresponding serial AT commands, you would achieve the corresponding functions. The system will be reduced to a simplest mode under Minimum Functionality Mode. It will save more power consumption in this mode. AT + CFUN = 0: Minimum functionality mode. In this mode, you can still continue to use the serial port, but the AT command with RF and SIM card features will be disable. AT + CFUN = 1: Full-function mode (default). AT + CFUN = 4: Airplane mode. In this mode, you can still continue to use the serial port, but the AT command with RF and SIM card features will be disable. If you are going to use SIM808 GPS/GPRS/GSM Shield with a Leonardo board, it will be more like a SIM808 GPS/GPRS/GSM mainboard. You can check its wiki for the user manual. Get SIM808 GPS/GPRS/GSM Shield For Arduino from DFRobot Store or DFRobot Distributor.